Happy Thanksgiving! If we're lucky, today is a day filled with good smells. Why shouldn't we smell good, too? I'm fairly new to the idea of natural deodorants. I'll be honest - being a Florida girl means that I like to stay in the Air Conditioning as much as possible. Sweating is not something I look forward to doing. 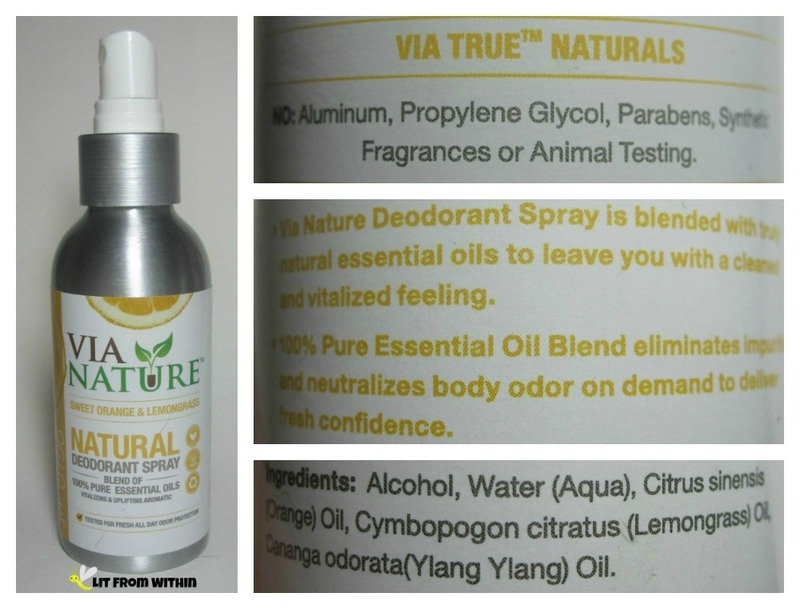 Natural deodorants are just that - deodorants - without the antiperspirant. The aluminum that most antiperspirants use to stop the wetness is a pretty controversial ingredient. There is speculation that it accumulates in the body and may be linked to neurological conditions like Alzheimers. I was able to try three different types of natural deodorants from Via Nature, in 3 different scents. 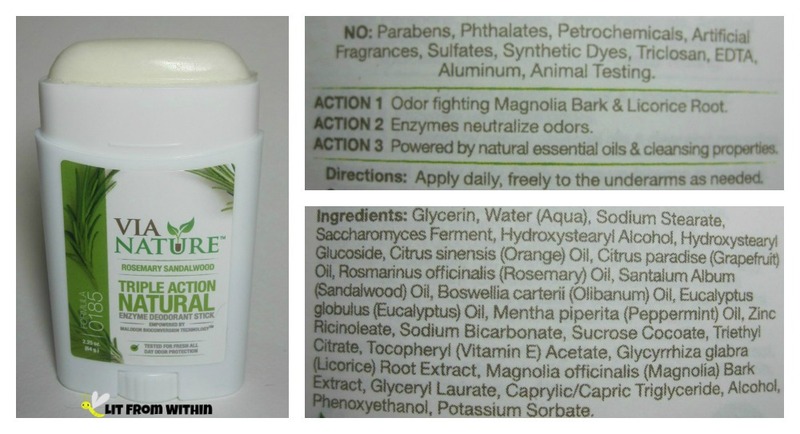 Their products are made with natural vegan ingredients, are cruelty-free, and are free of Parabens, Phthalates, Petrochemicals, Artificial Fragrances, Propylene Glycol, Mineral Oil, Sulfates, Synthetic Dyes, Triclosan, EDTA and Aluminum. I really like spray deodorants for fast, even distribution, especially over large areas, or hard-to-reach ones. If you like citrus like I like citrus, you're gonna LOVE the Sweet Orange and Lemongrass scent. 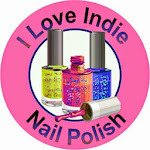 So bright, fresh, and invigorating, it comes on strong and lasts a while. It can even be used as a room spray, if you're so inclined. The spray is a little wet at first, but it dries fairly quickly, and never stained any of my clothing. I did have one interesting reaction to this spray. One particularly hot day, I decided to spray this liberally under my breasts. It warmed up my skin, and then it burned! I had to rinse it off. I think the natural oils were too strong, or maybe I didn't shake it up enough. It never burned under my arms, or anywhere else. The stick deodorant was most like what I was used to, and applied much in the same way. It smelled deliciously of rosemary. This was my 'hurry up and go' pick because it was so easy to apply, and was immediately dry. I recommend keeping the plastic seal around for this style, because otherwise the cap wouldn't stay on! For some reason, the cap would slowly lift itself off the base, unless that seal was on the deodorant first. The Lavender Eucalyptus Roll-on was my go-to for night-time application. The smell is so calming. It applies very wet, like a roll-on does, but doesn't take long to dry. It wasn't sticky at all, and is clear and non-staining. Even though natural deodorants work better on clean skin, I found that I liked applying a bit of this deodorant at the end of the day. I have been applying deodorant twice a day for many years now, and I think I'll keep using this one before bed. It's a quick way to freshen up before snuggling up with the husband. I had read that sometimes the body 'purges' after a while of not using traditional antiperspirants, and gets a bit stinky. 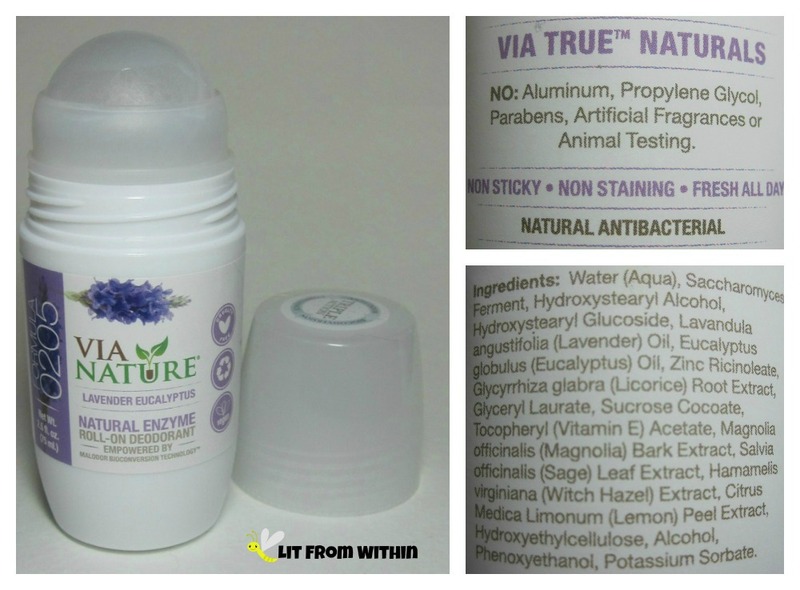 After a few weeks of using nothing but these natural deodorants, I did experience that. I had some stinky armpits that could not be quelled for long by any means - I even tried going back to a traditional antiperspirant for a couple of days, to no avail. My husband said he couldn't smell it, so maybe it wasn't that bad, but I was a bit self-conscious about it. After about a week, my body righted itself, and the funk was lifted. 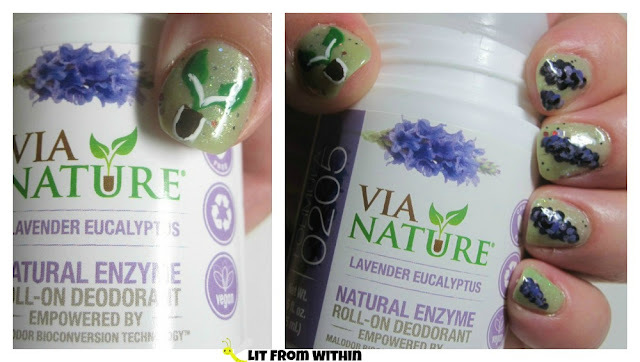 I based my nailart today on the Via Nature logo and the lavender graphic. The base is Paris Sparkles Celery Stalker. I used Sally Hansen Salon Plumtarius and L'Oreal Masked Affair for the lavender, and Butter London Sozzled, Finger Paints Sketchy Character, and a white liner for the logo. I actually really enjoyed using these natural deodorants for the past couple of months. I looked forward to the great scents, and felt like they were doing their job (except during the Great Purge.) I've been using traditional antiperspirants for so long that I did notice when I did perspire. If you think you might be self-conscious about it, try switching over a long weekend, or on vacation, and see if you like it. If I didn't have other products to test, I'd keep using these. In addition to being able to use the spray deodorants as room sprays, Via Nature also has some holiday room sprays. They also carry a line of skincare and essential oils. For more information, or to purchase, you can find Via Nature on Facebook, Twitter, or their webpage, where their roll-ons currently retail for $5.99, the stick deodorant currently retails for $6.99, and their spray deodorant currently retails for $7.49. Each version is available in all three scents, as well as an unscented version.